The injury to this Arab endurance horse resulted in a large flap which was removed because it could not be sutured in place and the lateral digital vein was re-sutured with very fine suture as it was only partly severed. The circulation was enough to maintain the foot and healing commenced. Both the lateral extensor and straight digital extensor were severed, and a large section of each was lost, therefore healing would result in only granulation tissue filling the defect. PVC water pipe was heated at the edge of my gas forge so that it would fit under the toe and sole, and then be bandaged without creating pressure on the front of the fetlock joint. This prevents the leg from knuckling forward. 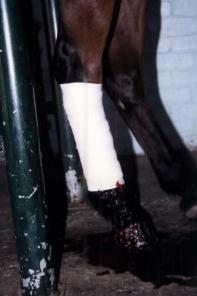 Fitted to the lower leg, it is bandaged from hock to foot. This allows the uppper limb to help to lift the lower limb ,and the horse then slides the foot forward. Note the splint is well away from the front of the leg at the top to stop it digging in as the horse moved. Healing to this stage was an ugly process at times, with dead bone needing to slough out of the wound and the granulation tissue being trimmed back, but at the time this photo was taken, granulation tissue has filled the defect after several months, and now the wound is failing to shrink or epithelialise further. This horse belongs to a Vet, and this made the whole process of saving the horse much cheaper. A lot of hard work and effort went into such a well healed wound. The first attempt at skin grafting with tunnel grafts failed, therefore, a series of punch grafts were used. The grafts all took, and the limb is now healed. Skin grafts must be placed into very healthy clean granulation tissue if they are to take. This leg was prepared thoroughly for the process. The grafts were covered in silverzene, and bandgaged in place. After 3 days this was removed, and they had all survived. Further bandaging was performed until the wound was healed. This horse will never be able to be ridden as before but he has a long and happy life in front of him as a paddock pet. Born with severe angular limb deformities, “Little John” was small and suffering from “windswept conformation” due to his position in the uterus and other congenital factors. Most severe was the toe-out conformation of the right foreleg (the off-fore). This case is an example of how good management combined with attention to farriery detail can be used to maximise the growth potential of a young horse in a successful attempt to normalise conformation. At 2 weeks of age, surgery was performed to elevate the growth plates just above the fetlock and carpal joints. At this time Little John was trimmed for the first time, and fitted with glue-on front shoes with medial extensions to increase the surface area to the inside of the leg. A severe deviation in the hock was also noted and trimming commenced on all 4 feet to minimise the conformation faults over time. John went home from hospital to a stable from which he did not leave, other than to go to a very small yard with his mother when the stable was cleaned. He was placed on a low energy, low protein, mineral balanced diet, and mares milk of course. The mare retained good body condition but did not gain weight throughout this time, as it is important not to push the growth rates of a foal with this problem. A rapid growth rate will exacerbate the conformation problems in foals. John was trimmed every 2 weeks until 3 months of age, with a slow but steady rate of improvement. Further surgery or shoeing were beyond the owner’s budget. At 3 months John was moved, with his mother, into a larger yard, (just big enough to move about), with grass and the trimming program was extended to every 3 weeks. At four and a half months the mare and foal graduated to a paddock. By 5 months trimming was extend to every 4 weeks. Improvement in conformation was very slow from 1 – 2 months. Between trims the right fore foot became noticeably longer to the outside (laterally) and the inside heel was shorter and folding under. Conformation began to improve noticeable between each visit from 2 – 4 months, and at 4 – 5 months the foot no longer distorted between trims and the conformation had significantly normalised. John was weaned between 5 and 6 months, and shares a paddock with other weanlings. At his last trim his foot had not distorted since the previous trim and his conformation is continuing to improve. He will require monthly trimming by the farrier to minimise his conformation faults, up to and after 12 months of age. The hock and hind limb conformation problems have also improved over 90% and the prognosis for a normal athletic career and future soundness is good. The classic navicular syndrome shape is a long foot, wider at the toe than the quarter with narrow contracted heels and frog. The hoof wall angle at the quarters is upright and in this case the toe is long and the heels are short and so is the shoe. This is not how to shoe for a good result. This horse was very lame. This horse has no heels at all! Ideally allowing for some decrease in tension on the deep digital flexor tendon will offer some relief from the pain of navicular syndrome. The low heels will make the problem worse. After rebuilding some heel with Equithane and dressing the toe from the front of the foot to move the point of breakover back under the leg, shoes were fitted with a graduated heel, a thinned and bevelled toe and greater length under the heels. This horse improved. It is important to mention that farriery trends vary throughout the world vary, and that what is considered normal practice in one country or location may be considered very abnormal in another. For example, contacted feet with long, upright heels may be common in Europe where horses are stabled during winter. In Australia, most horses live in paddocks until 2 years of age, and flat feet and underrun heels are common in many areas. These predisposing factors are due to a combination of genetically inherited foot conformation, breed, overall management, diet, exercise, stabling, frequency of farriery care and the skill of the farrier. Genetic and environmental variety is reflected in the varying causes of navicular syndrome. Farriery, breed and management are significant factors influencing whether a horse does develop navicular syndrome, and just like laminitis, the risk of a horse developing navicular syndrome is reduced by improved farriery and horse management practices. A chronic degeneration of the navicular bone in which there is damage to its flexor surface and the overlying flexor tendon in the front feet of the horse. There may be an accompanying navicular bursitis and osteophyte (bony outgrowth) formation. 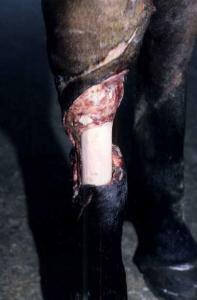 The syndrome is characterised by intermittent lameness (Blood and Studdert, 1999). After surgery and toe extension with Equitane®, and fitting a graduated toe shoe. An exercise program started three weeks after surgery. 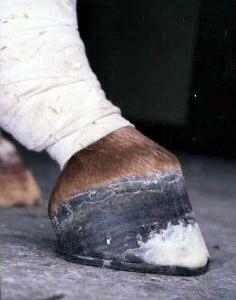 A normal hoof/pastern angle is achieved over time. This filly was presented to an equine surgeon for assessment at 18 months of age with a severely clubbed right front foot, (broken forward hoof-pastern angle). The foot was short, contracted at the toe, wide at the heels, and unable to be extended into a normal position. Therefore, shoeing alone was unlikely to offer any significant improvement over time, and her foot was likely to cause her lameness problems and severely limit her future potential as a show or riding horse. The filly was given surgery to cut the check ligament of the deep digital flexor tendon, (inferior check ligament desmotomy). Before discharge from hospital, 3 days post surgery, it was decided to extend the toe of the clubbed foot with a hoof reconstruction material (Equithane), and to fit a graduated-toe shoe to prevent further toe wear and offer protection. At this time, it was noted that an abscess had formed at the toe and the wall was separated. These are common findings in young horses with severely clubbed feet, and further contribute to the abnormal pattern of wear and chronic separation of the white line and dorsal wall (toe). 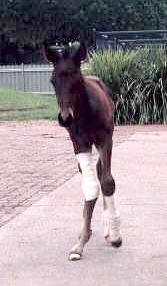 The filly was initially given hand-walking as exercise, and this was increased to include gentle lunging at the trot by 3 weeks post surgery. This was continued throughout the recovery period of 4 months. During this time the filly had the shoe removed and refitted at 4 weekly intervals. 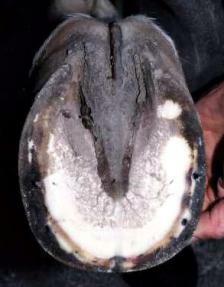 Improvement in the hoof-pastern angle was noted at each shoeing. It was advised to continue protecting the toe of this foot with either a shoe or tip until at least 6 months post surgery. After this, the foot should be allowed to go unshod if possible, as this will maximise heel function and expansion of the foot while the filly is still growing. Regular trimming at monthly intervals is still required. If the toe should begin to shorten, and the foot becomes more upright, then fitting a shoe or tip will again be required. When I last saw this filly her owners were considering a riding career for her and her future looked much brighter. However, there is a genetic component to this condition and therefore, I would be unable to predict that this filly would, or would not, produce foals that were at risk of developing the same problem. 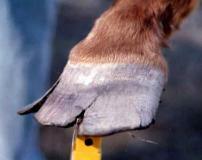 This is a machine made bar shoe that has been shaped to fit this horse’s hind foot. The sole is exposed and needs protection, and the shoe has been modified to take a hospital plate which is an aluminium plate bolted into the shoe. An old road sign was used to make the plate and the bolts and tapping tool are available from good hardware stores. The shoe is heated and allowed to cool slowly so that it does not become too hard and is then drilled, tapped and the bolts are cut to length and fitted. The plate forms a very strong barrier between the sole and ground surface and offers maximum protection to the sole and pedal bone. 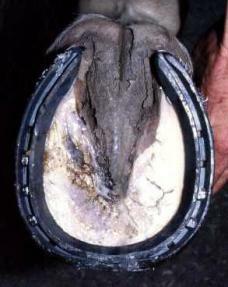 The continuous surface of the shoe prevents the sole filling with dirt and bedding, and the wound can be covered with medication and dressings and changed frequently if needed. The bolts are undone and the plate lifted during treatment. Silicone sealer around the heels and Elastoplast tape around the sole and wall can be used to form an even better seal and keep the injury clean. This type of shoe is used for treatment of penetrating injuries of the sole, after surgery such as resection of infectious osteitis, and other traumatic injuries to the sole. For most injuries and pain in the back half of the hoof, long, under-run heels, corns or injury to the heel or quarter, bar shoes offer protection and a greater weight-bearing platform for the horse to stand on, shifting support further back under the leg, giving an instant improvement in many cases. The shoes offer protection while an area is resected or relieved from pressure due to an injury. 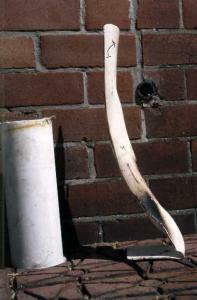 A partial version of a bar such as a G, mushroom or V shoe is used to greatest effect for this purpose. After bar shoes are fitted to chronically sore horses they often look relieved to finally have something under the foot for support. The difference between an egg and straight bar is that the straight bar can move more weight-bearing support onto the frog if desired, and does not extend as far under the heels. A straight bar shoe with a small frog clip is often called an English bar shoe. All bar shoes have similar benefits and can be fitted with rolled or set under toes, fullered, plain stamped, concave, deep seated, clipped, side clipped, or graduated in thickness from toe to heel, or heel to toe, as required for the individual. Many machine made varieties are available in aluminium or steel and are easily modified. Always address the basic principles of farriery before resorting to bar shoes. Although usually beneficial, bar shoes can also cause excessive frog or heel pressure. This is worse if the heels and frog have not been trimmed correctly and the heels are long and folded under. This will cause lameness in its own right, which can easily be confused with the need to fit bar shoes in the first place. 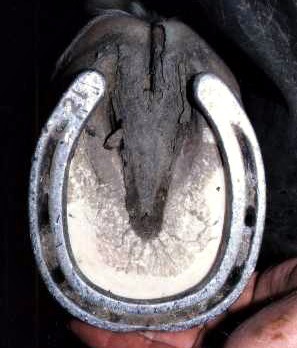 Many horses with bar shoes improve once they are removed and shod properly, which indicates that all the horse needed in the first place was a balanced, well fitted set of shoes. 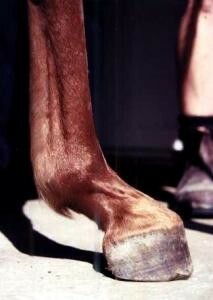 Bar shoes may force the hoof to land earlier, affecting the stride, and are often used to improve gait problems. However, bar shoes can also cause gait problems and should be used therapeutically and are not usually recommended for the front feet of horses working at speed. Always remove bar shoes and return to standard shoes when they are no longer required. I avoid bar shoes unless they are strongly indicated for the horses problem and are showing a benefit once fitted. Egg bar shoes increase the weight-bearing surface and create a larger area of posterior support for the foot and leg, thus moving the center of gravity further backwards supporting under-run heels. Corns, contracted heels, navicular disease, laminitis, heel injuries, and race horses that go “down on the bumpers” may all benefit from these shoes if applied properly. Available in machine made varieties from steel through to aluminium alloys, many farriers hand make bar shoes for the individual horse. 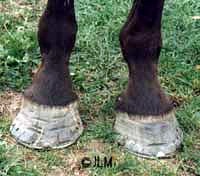 Greasy heel attacks the lower leg, usually in the fold of skin at the back of the pastern, just above the heels. There are horizontal fissures and a dry crust over red, ulcerated and exudative skin. These lesions are very painful to the touch. 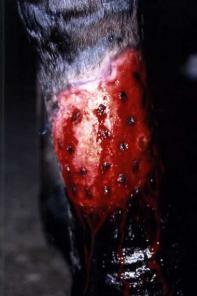 A weeping, inflamed sore quickly spreads, and is highly contagious to other horses. A form of non specific bacterial and or fungal infection which is similar to thrush is in its list of predisposing factors – including poor diet, filthy stables, a damp environment, or humid conditions of any sort. For example, well fed and cared for race horses will get it because they are worked and wet every morning, and if the legs are not towelled off correctly, they take a long time to dry in winter. 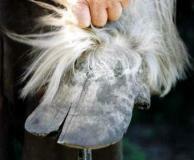 The draught horse is also predisposed as the feathers hold heat and moisture close to the skin. The initial infection can lead to chronic, painful dermatitis of the back of the pastern. The best prevention is to clean and dry the legs thoroughly every time you wet the horse. Use disposable paper towels. Equipment that will be re-used, should be washed daily, and dried in the sun to prevent spreading the bacteria to other horses. Treatment involves improved hygiene and management. Wash the affected area thoroughly with iodine scrub and remove all the scabs until the area is pink and clean. Dry thoroughly and clip off excess hair. Treat with specific, commercially available treatments or try a 5% copper sulfate solution, or a zinc sulphate solution (refer to thrush). A fungal cream combined with an antibacterial cream makes a good ointment. Use disposable paper towels and for drying, and wash your hands thoroughly. 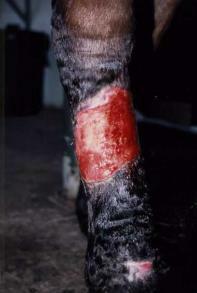 The infected horse should be last on the list for grooming, and touch the infected leg, (if only one), last of all. Please note that occasionally, what looks like bacterial dermatitis or greasy heel, may be due to vasculitis, photosensitisation, (caused by plant toxins and/or liver disease), or a fungal infection etc. Therefore, if your horse does not respond to topical treatments, hygiene, and diet changes, the condition warrants veterinary investigation.